HomeLatest NewsGood Luck to our State PPMG Team! 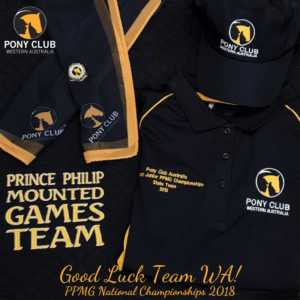 Good Luck to our State PPMG Team! GOOD LUCK TO OUR STATE PPMG TEAM? Our State PPMG Team are busy preparing for their trip to Victoria. The Skye Park PCA National Junior Mounted Games Championships 2018 will be held this Saturday 6th October 2018 and will be hosted by Pony Club Victoria. Pony Club WA would like to send our competing State Team good luck for the Championship and wish for a safe but exciting trip over east.